Children can carry their own Survival Kit if it is an appropriate weight. Taking into consideration the size and weight of your child, the following suggestions are designed (generally) to meet the needs of a child approximately 7-12 years old. One difference between a child's survival kit and an adult's are items to psychologically keep them occupied during an emergency situation. Your goal as a parent is to keep them as calm and comfortable as you can. Begin by buying a quality backpack, then fill it with the appropriate items from the list below. Feel free to personalize as needed for your child or children. 10 Water Purification Tablets (each tablet purifies 1 liter of water) or small water purifier. Small Cans Tuna, Vienna Sausages, etc. Hygiene Kit - Includes soap, toothbrush, toothpaste, and wet wipes. Children's Toys - jump rope, paddle with ball, books, etc. 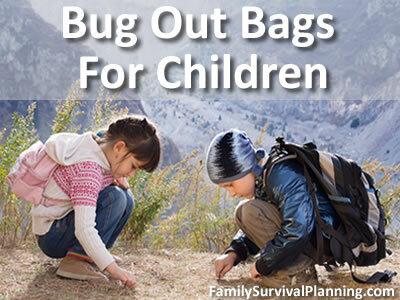 Update your child's bug out bag every six months (put a note in your calendar/planner) to make sure that all food, water, and medication is fresh and has not expired, and clothing fits. Every child's backpack should have a laminated page with parents' names and phone numbers, home address, local emergency contact people as well as one or more who are further away (a grandmother or other relative out of state). If a child gets separated from parents during an emergency, this information is vital. Teaching your child how to use all of the items in their survival kit is just as important as filling it up. Talk to your child/children at least twice a year and go over the function of every item an emergency (earthquake, tornado, flood, etc.). But don't stop there, use everyday opportunities to share your knowledge of preparing. Especially when you're camping. Try and include fun activities where they are required to test their new found survival skills. What advice do you have for parents who are building survival kits for their children? Household Disaster Kits - For everything that won't fit in your B.O.B. Auto Emergency Kits - Easy to buy or put together and include one in each vehicle.